One of the first things we did after arriving in Key West was buy plants. We started with a beautiful Yellow Hibiscus tree, two pink Mandevilla and two "house" plants. One house plant has been outside for the last 3 months, and the other is dead - both due to Minx thinking they were her own private salad. A few weeks later I decided to try my hand at container gardening for actual edibles. I had purchased a tomato growing kit for $1 at Target several months before I moved, and decided it was time to try it out. The kit included a 2-inch clay pot, some soil and some seeds. My first attempt is now 4 feet high, has several flowers and even 1 baby tomato growing. At that same time I started seeds for lettuce. They have since grown up and been eaten. We also purchased baby plants for oregano, basil, jalapenos, early girl tomatoes, rosemary, cilantro, italian parsley and catnip. We can't use the basil and oregano fast enough, but are enjoying cooking with fresh herbs. Scott made homemade cornbread last week with one of the first jalapenos. 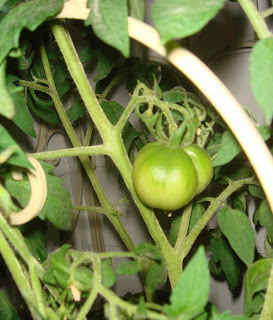 The picture above is the first early girl tomato and we are anxiously awaiting it's maturation! The weather in Key West since we returned from our Christmas vacation has been the coldest I've felt yet. The skies are often grey and it drizzles now and then. Last Thursday was an exception. Sunny and around 80. Donna, Ray and I stopped on the way back to the office to have lunch at a pub on the Boca Chica Naval Base. The view is beautiful and I enjoyed my grilled cheese sandwich in serenity. I feel like I work with a Bunch of Animals. I started a 2nd job this last week at a local pet store helping out in the office. I'm having a lot of fun and getting a few extra hours in which helps since my main job was cut to 30 hours right after Christmas. On Friday when I went into the office at the pet store, I got to hang out with a beautiful red and blue parrot named Abigail. We spent the last two days madly cleaning our condo as the realtor had an open house today for a couple of hours. 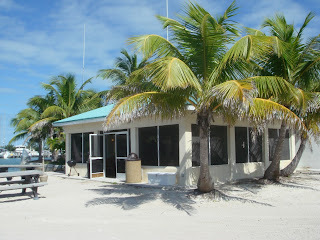 Our condo is for sale and if it sells and the new owner does not want to rent it out, we will have 30 days to move. Fortunately for us, there were no offers today.